It’s Veteran’s Day, and veterans tell their stories. I’ve heard Robert’s Vietnam Vet stories over the past 20 years. Some heavy parts stay hidden, but some lighter parts he talks about. He’s the storyteller and I’m the writer! So, here I go with the lighter parts from his enlistment, to basic training, to navy life on the USS Manatee, and the USS Camden. USS Manatee AO 58 at Subic Bay in the Philippine Islands in 1969. Decommissioned July 1973. Sold for scrapping December 1973. USS Camden AOE2 was the second SACRAMENTO – class fast combat support ship and the second ship in the Navy to bear the name of the New Jersey city situated at the Delaware River across from Philadelphia. Last home ported in Bremerton, Wash., the CAMDEN was the last ship in her class to be decommissioned. Stricken from the Navy list on October 14, 2005, the CAMDEN was towed to Brownsville, Texas in 2007 for scrapping at Esco Marine. Scrapping was completed on May 13, 2008. A Navy man from 1970-1976, Robert A. Dorchester’s initials RAD, the Rad-man, by chance, fit his job description to a tee. After three months in boot camp, he finished AB and C, 2304 school and qualified for radioman, specific electronics training, and Morse code. In his senior year of high school, his step-dad told him to go enlist in the navy right after graduation. His grandfather advised him to sign up for an electronics specialty before he hit boot camp training. Good advice beforehand. If he hadn’t he might have just gone to the fleet as a bosun’s mate and done maintenance work. Plus, the radioman’s choice had a cool uniform patch, three lightning bolts on his shirt sleeve. The San Diego Naval Training Center was a three hour motorcycle ride back and forth to Robert’s home in Palm Desert, California. He trained on base weekdays and had some weekends off when he wasn’t on duty. He made it to E4, 3rd class after training and school. Boot camp basic training was a physical and psychological re-training of your mind to take orders and be disciplined to survive. What if you were thrown overboard? Your clothes and your cap were tools to survive in the water. For example if you didn’t pay attention and know your shirt, tied in a certain way, could keep you afloat, you’d drown! While in training, there were a couple of highlights that stuck in his mind. On the subject of drowning, it’s just a given that a navy man can swim and tread water for about 30 minutes. Again, what if you were thrown overboard, or the worst scenario what if the ship went down! For Robert that first week of water training was a snap. He’d been on the swim team in high school and qualified as a helper to the “agitant” sailors with long poles who pushed recruits away from hanging onto the sides of the pool. Robert treading water with no problem pulled the ones who couldn’t swim or tread in the middle to the side of the pool, and the “agitants” pulled them out! It’s obvious, the non-qualifiers were out of the navy, and first hand thinned out the company herd by about 40%. Who would’ve thought a new, clean white tee-shirt, straight out of the package worn at barracks inspection was “tee shirt dirty.” According to boot camp training, all clothes had to be washed before worn. Who knew? Robert stood at attention with a spanking new tee shirt on. The company commander pushed him out of line, down on his cot, and slammed a rifle across his chest. Robert never messed up again after that? No way! Sometimes communication just gets screwed up! Halfway through navy boot camp, Robert found out that he had been drafted in the army. The letter went to his house sometime after he enlisted in the navy, and it became the letter that disappeared into thin air. But, of course, the news found its way to the base executive officer (XOs) desk. Robert was called into the XOs office. The three month boot camp training was over. Robert had retested weekly with success, the necessary requirement to keep the A, B and C, 2304 status. Robert flew from San Francisco to Guam and onto Clark Air Force base receiving in the Philippines. 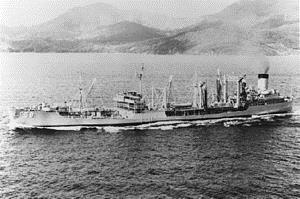 The recruits were staged there in receiving, and put on busses to Subic Bay. It was a one lane dirt road, jungle on both sides. They were on that road for several hours. Scenery out the bus window was jungle, jungle and more jungle, until they hit a small clearing. And what did they see? A KFC take out restaurant with small tables outside. Two old Filipino men eating Kentucky fried chicken waved at then as they flew by. Humor aside, the recruits were warned to stay out of the jungle at any cost. Al Qaeda and treacherous pirates hid in the jungle depths. Robert completed two Westpacs, one on the USS Manatee, and the other on the USS Camden. He traveled to Sasebo, Japan, Taiwan, and Hong Kong for R&R stays on the first Westpac. His second Westpac was on the USS Camden, its hull as big as an aircraft carrier with ordinance weaponry; missiles, cannon shells, ship oil, and jet fuel. It was a floating time bomb! Life expectancy under heavy attack was approximately two minutes. 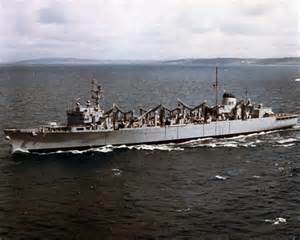 Both ships were on the line off the coast of Vietnam, refueling and providing supplies for the entire 7th Fleet in the designated area, the war zone. Toward the very end of the war there was mass evacuation of everyone who could get out in time. There was panic throughout the region as the communists aggressors drew closer to Saigon. One day out from Subic Bay on their way home from Westpac, Robert received a highly classified message for the fleet to turn around and return to the Black Sea to have a stand-off with the Russian fleet just beyond the horizon. Total radio silence for three days. Then they were told to turn back around and head for Hawaii. No explanation given. Robert was certain it had something to do with the Russian stand-off in the Black Sea and the shortage of gas at the pump. Aftermath of that, remember the long gas lines? It never was too clear if it was contrived or organic. In the end, Robert the Radioman was doing just what he was supposed to do. Everyone on board was trained to do what they were supposed to do, and knew their job. That’s how ship-board navy life was! In addition, they traveled and met great people throughout Asia. This entry was posted in Featured Friends, My Blog, My Entries and tagged A veteran's story, Boot camp, Enlisted in the Navy, Heavy parts hidden, Letter disappeared in thin air, Lighter parts talked about, Mind and body re-training, Morse code, RAD, Recruited in the Army, SD Naval Training Center, USS Camden, USS Manatee, Your tee shirt's dirty. Bookmark the permalink. Thank you, Christine for taking time to chronicle this part of Robert’s military history. I don’t think any vet who has made it through boot camp ever forgets those harsh lessons. My Hub says it was unbearable but invaluable. I love the KFC anecdote – straight out of a MASH episode!! Please thank Robert for me for serving in such a controversial conflict in very inhospitable conditions. We learned at local vet commemoration today that National Cemeteries and vet organizations will begin planned events and commemorations in 2015 for the following 5 years to commemorate the 50th annuversary of the start of the VietNam War (using 1965 as the commencement date). I cannot believe 50 years have passed, but I look forward to highlighting our vets from the VietNam era. Thank you, Sammy D for your thoughtful comment! Robert appreciates your thanks for his service and for understanding the controversial conflict he was in the middle of. Good to know the future plans to commemorate the 50th anniversary of the war start! The Vietnam vets need that! I particularly love the reaction of the Navy when learning Robert was drafted into the Army. SNAFU. My father was US Army, a veteran of Korea and Vietnam. He served in Saigon in the Signal Corps and was for the most part out of harm’s way. Please thank Robert for his service. We didn’t, as a nation, treat those vets the way we should have and have much to make up for. Barbara, thank you so much for your thoughtful comment. Robert appreciates your understanding of how it was for service men during the Vietnam War. Hard time for him when he came home to controversy. You know these things coming from a military family. The SNAFU, and the “tee shirt dirty” dialogue was word for word. Robert remembers so much about his navy years of service. I like to keep him in the lighter parts of his story!